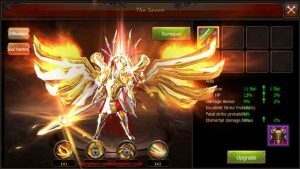 Mu Origin Invictus : Mu Origin new version , this Role-Playing Game (MMORPG) has amazing features to enjoy your experience. This is the newest version of popular online Game Mu. Earn profits everyday! In the trade market, you can sell all the items you don’t need or extra equipments you obtained from killing bosses or other quests. None of your items or time shall be wasted. Freedom of choice! A lot of precious items in the trade market for you to pick. “Fair play” proceeds fast growing and level up with plenty of resources needed for growth by doing daily quests, killing bosses and unlimited PK & events. Offline autoplay system helps you to upgrade and gain resources easily. 24h non-stop to be the top player. Fast grow and level up! In This fantastic Adventure game you can choose among 5 Races to become the most powerfull warrior of the Continent MMORPG. Powerfull Warrior uses physical strenght to fight and carry amazing weapons. Mighty Archer uses her speed to master the long range Bow. The Magician that uses the mind control to cast powerfull spells to put their enemies into their knees. Magic Gladiator that combines both strenght and wizardry you can choose which one to master. The mystic Summoner that can cast amazing spells to destroy any enemy. This great 3D MMORPG Role Playing game has the most advanced Graphics to date, Amazing game play. Mu Origin MMORPG will blow your mind with their easy game play. Flying mount, really cool and useful. Dozens of cool mounts including Phoenix, flying rocket Kuma bear and so on. Accompany you to travel across the grand open world . Abundant wings will make you stand out of the ordinary. Will you be the angel and save the world ? Many costumization for your character, Many Wings, Suits, Footprints, Weapons and mount skins for your Character and your pet this role playing game will get you entertained all day. Many Multiplayer events, you can fight with your friends in many ARENAS including 2v2, 8v8 and All vs All in this Mu Origin experience. Mu Origin Invictus will make you spend hours and hours of great fighting experience, you will become master of strategy to put your enemies to their feet. Real time Arena and Legionary crusades will keep you busy and entertained. As territories expand, threats loom larger. Join battles with up to 1000 players to win your guild the highest of honors! In this great free MMORPG you’ll need to use strategy and finesse to expand your will and rule over all! Love and battle make a perfect combination in (Mu MMORPG) -Origin . Show your love to the entire world through luxurious weddings and romantic feasts. Take your chosen one down the rows before heading to the battlefield for glory! Born in the old lands of Elveland, powerfull (Summoner) combine their skills at magic to bring out their inner power. While Gods and Demons fought, (Summoner) stood their ground to bring peace to all creatures! Mu Miracle Origin is a free to play (MMORPG), you need active internet connection to play. the best rpg i played so far..graphics,gameplay and controls are awesome..hope to have more in game rewards cause my 2m bound diamonds are all used up overall a great game! Awesome game, lots of freebies when starting out unlike other games out there. only problem is that I keep havimg desyncing issues. This game is good than other MU Mobile, Invictus is better because of low storage consumption, and i like this game many fellow PH Player so. Good game.